Is it just me, or do many guitarists these days find themselves alternating between separate analog and digital setups? I’m posting some pics of my current pedalboards (bearing in mind that, for reasons I’ll get into in a sec, my pedalboards only tend to stay “current” for a few days at a time). Both were assembled using store-bought housings, though I’ll talk a bit about total DIY boards as well. 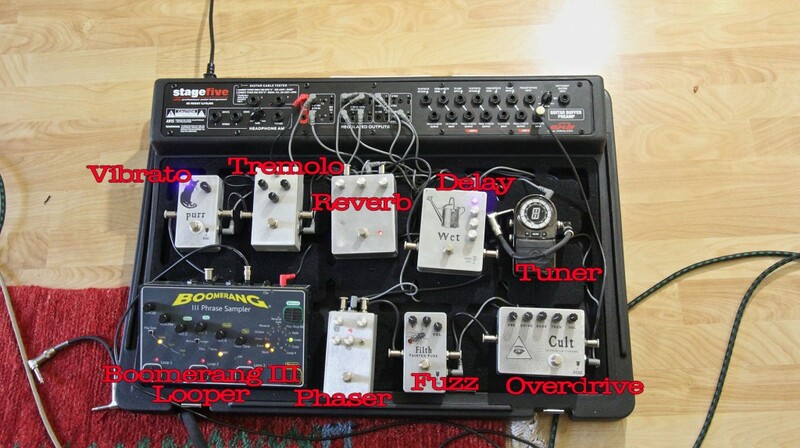 First, the mostly analog setup (the exception, of course, is the digital Boomerang III looper). 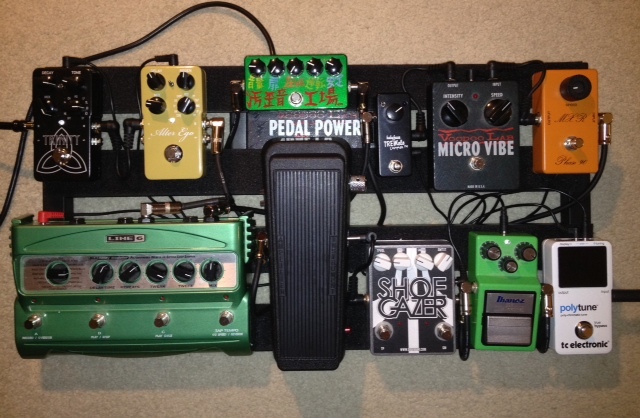 Joe Gore’s mostly analog pedalboard. The case is a newly purchased SKB Stage Five, a full-featured unit in a relatively rugged molded plastic case. These retail for a whopping $540, but you can find them heavily discounted. (I forget the exact price I paid for mine, but it was under $300.) It’s loaded with cool features, like dual effect loops, a built-in buffered preamp, and support for 9- through 24-volt DC power, plus 9V AC for those digital pedals like Line 6 modelers and many loopers. There are even trim pots on a few power jacks to simulate dying batteries. I’m less impressed by some of the fittings (like the cheapo plastic jacks), though I suppose they keep the weight down. And make no mistake: This thing is heavy! Verdict: Too early to tell, since I haven’t subjected it to road abuse, but I trust it enough to at least give it a go. I think I’d be a bit disappointed had I paid full pop, but it strikes me as a fair deal if you can find it at a 40+% discount. A few words about those homemade pedals: Two of them (the reverb and the phaser) are Build Your Own Clone kits. I’m a huge fan of their products. Not only did they help me learn volumes about analog circuitry, but most of their kits offer clever options and added features that inevitably make them better than the originals. Their documentation is good as well. I’ve built most of their kits, and the results have ranged from cool to unbelievably cool. Two other pedals — the delay and the tremolo — are non-kit clones. The delay is a straight-up copy of a first-generation Way Huge Aqua-Puss, as reverse- engineered by the brilliant freestompboxes.org community (who confirmed in the process that this coveted analog delay is pretty much a straight-up clone of another coveted analog delay, the Boss DM-2). The trem is made from a popular DIY circuit known as the “EA Tremolo,” because it’s based on an unattributed schematic that appeared in Electronics Australia magazine decades ago. 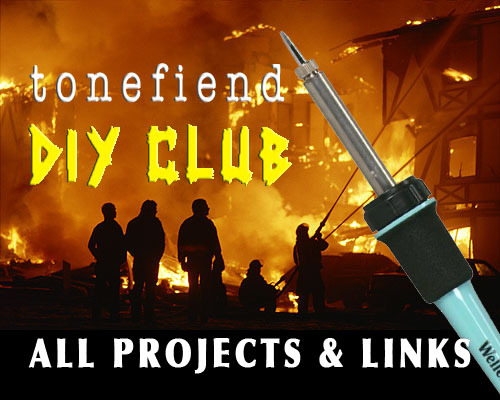 It’s a simple but great-sounding circuit that’s also available as a kit here, here, and here. The vibrato, fuzz, and overdrive are my own designs — or more accurately, highly customized versions of various old-school analog circuits. The tuner is a nice little model from Planet Waves, though to be honest, these days I’m more likely to rely on the iPhone/iPad Cleartune app. The cables are all George L, which I like because they sound great, they’re reasonably priced (for audiophile cable), and you can make are repair them using just scissors and a screwdriver. Ah — nice and simple! There’s another Boomerang III, this time accompanied by the Side Car unit, which does no processing of its own, but simply provides an extra set of switches so you can access more of the looper’s features without having to reassign the footswitches. 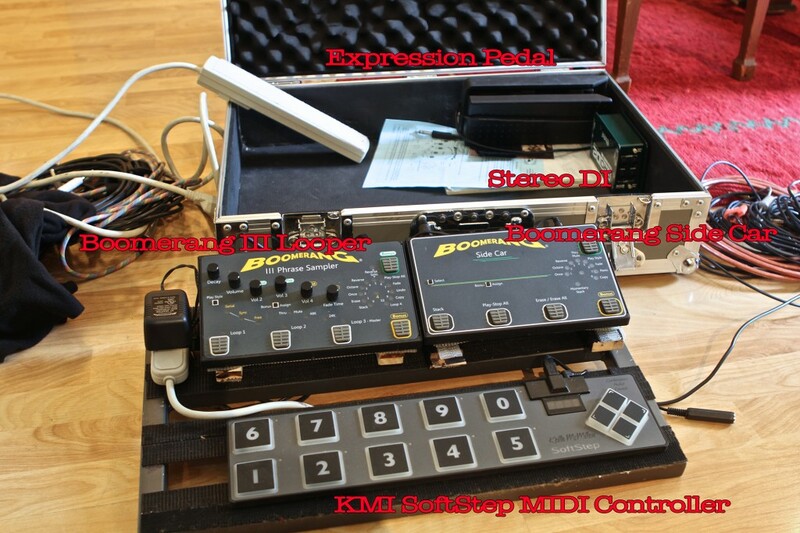 Below these is a Keith McMillen Instruments SoftStep, a light, sturdy, powerful, and ergonomic MIDI controller. (Disclosure: I’ve been paid in gear and money to do demos and consulting for KMI.) It’s also one of the few USB-powered foot controllers. My signal goes from the guitar through an audio interface (I have many, and am not 100% satisfied by any of them), which I usually keep alongside my laptop. The processed sound returns to the looper via the interface, and then goes directly from the looper to either my mobile PA or the house sound system. When using the latter, I employ the stereo DI box you can see in the pedalboard case. Next to it is the generic expression pedal I often connect to the SoftStep. The pedalboard frame and case are from Pedaltrain, whose products I’ve been using for over a decade. They’re light but sturdy, and you can choose from various case options, including the truly roadworthy steel-reinforced one shown above. The open-frame architecture of Pedaltrain boards is great for routing and concealing cables, and it makes it relatively easy to reconfigure things. Unlike the Stage Five, Pedaltrains include no power supplies. I only need an outlet or two for my digital setup, so I just use a small power strip. But when I’m using a lot of stompboxes, I go with various Voodoo Lab Pedal Power products. Anyway, these are my setups as of today. But my pedalboards only remain unchanged for very short periods of time, and not just because I’m restless and twitchy by nature. There’s always some new piece of gear I’m excited about, or some new sound I’m trying to obtain. The only time I come close to locking in a particular setup is when I’m on tour, and even then, things can get shuffled around. (Especially when I’m lucky enough to have a gifted tech to do the dirty work. Thanks, Brody, Wolfie, Barry, and everyone else!) I used to try assembling an ad hoc pedalboard when I went in to work on an album project, but as Rocky the Flying Squirrel likes to say, “That trick never works.” Before tracking a single song, everything would be torn up, and I’d be sitting in a Sargasso Sea of cables and connectors. These days I just bring a generic velcro-covered surface and a mail crate stuffed with stompboxes, and assemble things on the fly. If you’re the sort of player who’s dialed in the tone of your dreams, maybe you can use a single setup for years. But I, for better or worse, am the opposite of that sort of player. Speaking of generic velcro-covered surfaces: While I’m currently building my boards on fancy store-bought boards, you can make perfectly great boards from plywood scraps, old cutting boards, and many other dirt-cheap materials. If you want something that looks fairly clean, try laminated cutting boards or shelving from Ikea or another flat-pack monger. I especially like using plastic cutting boards because they’re so light yet indestructible. Okay, I’ve showed you mine. Now show me yours! Have you had a chance to try the KMI Stringport? I was looking at one seriousiy and was waiting for the Windows version to buy one but they don’t even mention a future windows version on the website anymore AFAICT. I really like the Planet Waves tuners with 1 cent accuracy I have one the older desktop units with rotary display and so does my daughter. My pedal board has a Peterson Stomp tuner on it right now tho’. For my IOS devices I’ve been using the original Peterson app but the Cleartone looks good and the price is right. The pedal board with your homebrew pedals looks cool with the cases all matching. I’ve always liked the Boomerangs I have the original with the 2.0 update (I was an installer for this area back then). The Rang 3 looks really good and I would have bought one but I got a JamMan Stereo for doing some repairs a while back. But the Rangs always seemed more user friendly to me and I love their foot switches which feel very accurate timewise. I still use my original Rang in my rack system for reverse echo and phrase manipulation. I’ve never tried the Stringport. And the truth is, I use only a fraction of the power of the SoftStep — mainly just as fancy on/off switches to control more elaborate constructions in MainStage software. Thanks for sharing your pedal boards. I am impressed by all your DIY pedal projects. I have only done a few simple studio DIY boxes such as a passive DI and Re-Amp box using high grade transformers. I definitely would like to take a stab at building one of the clone pedals someday. 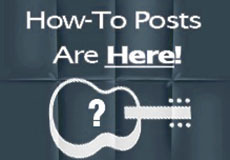 I’ve uploaded a photo of my current pedal board with this comment feed. Like you I do change it up fairly often because I do have extra pedals laying around to throw into the mix. My current setup is a mixture of tried and true with some boutique models thrown in. I run my signal chain starting with a TC Electronic Polytuner then routed to a Dunlop Cry Baby 535Q, then to a TS9, a Devi Ever Shoegazer, a ZVEX Fuzz Factory, MXR Phase 90 Script, Voodoo Labs Micro Vibe, Lovepedal Babyface Tremolo. For Delay and Looping I use a Line 6 DL-4 followed by TC Electronic Alter Ego and Trinity which are special versions of their Flashback Delay and Hall of Fame Reverb pedals. These are all set on a PedalTrain using Lava Cables and powered by Voodoo Labs Pedal Power II. I’ve avoided pedal boards for irrational philosophical reasons… I don’t care for that well ordered look, I don’t like velcro, and I especially don’t want to feel locked into a specific group of pedals in a specific order. My favorites and favorite combinations are always changing. I like walking into a playing situation, even a live gig, with more pedals than I need and using intuition and triage to determine what’s going onto limited floor space (or table, I like some effects on a small side table) and what stays in the bag. But damn it gets to be a hassle too. Hate it when it takes me more time to set up than the drummer. I have a ton of pedals on my board(might have seen the pic somewhere around here)and I am exactly the opposite. I get a pedal , decide where it goes(many different options examined)then find the setting on it that I decide is best sounding.Then it pretty much stays there until I pull it up to add another or put together a smaller “travel” board. I’ve only just got my first pedalboard, the tiny but functional Pedaltrain Nano, currently populated by a Boss TU-2 tuner, a Joe Gore Codpiece booster and a Maxon analog delay. I’ve got enough room to fit one more pedal, which will be in rotation as per need. My fuzz and wah rarely make it to the gig, but if they are needed, will live off the board, which resides atop my amp. If I ever feel like I need more real estate, the plan is to purchase a second Nano for the overflow and continue to use a stripped down “needs only” board for my day to day gigs (which require little in the way of fuzz/modulation effects. I have been looking at doing the BYOC Phase Royal for a while now. Obviously you recommend it but if you were to build it again would you change anything? It’s basically a “script” Phase 90 with a bunch of (genuinely cool) options built-in. And a perfect example of the great ideas Keith from BYOC regularly comes up with. I’m a fan. I’m interested in your digital set up; I find the main obstacle in having digital components in chain to be the AD/DA-converters and not the digital processing itself. Ideally in your setup (or any similar) it’d be great to have a looper (or any other digital piece) with digital ins and outs option to avoid dependence on cheap converters they employ. That way you could group all digital stuff together and use only one decent in/out converter. For the industry this would mean adding another board to support the digital ins and outs but those few additional $$$ might look like a huge deal and nobody is asking for that anyway. What’s your take on this? 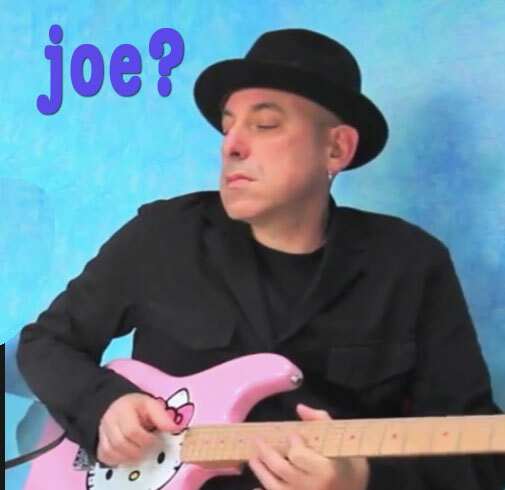 This is a great a peek into your pedal madness, Joe. Thanks muchly for it! I have tried using a Line 6 X3 Live for both analog and digital fx. It has been great *if* I use the models and go direct. But there’s something whacky in the gain stages to use with an amp. I think it’s the idea of unity gain vs. MORE than unity, which is the extra freedom of analog. So I am looking into more analog stuff as a separate board. Probably going to start with a JHS Morning Glory (http://www.jhspedals.com/products/guitar-pedals/morning-glory/). Let me know if anyone has used a digital multi-fx thingie as a straight pedalboard with any success (Line 6 HD, Roland, etc…). Thanks again for such a great blog Joe! this is mine … we use the same tuner !